We photographed this mid-1980s Peugeot J9 on a vacant plot of land next to a restaurant a couple of villages over. 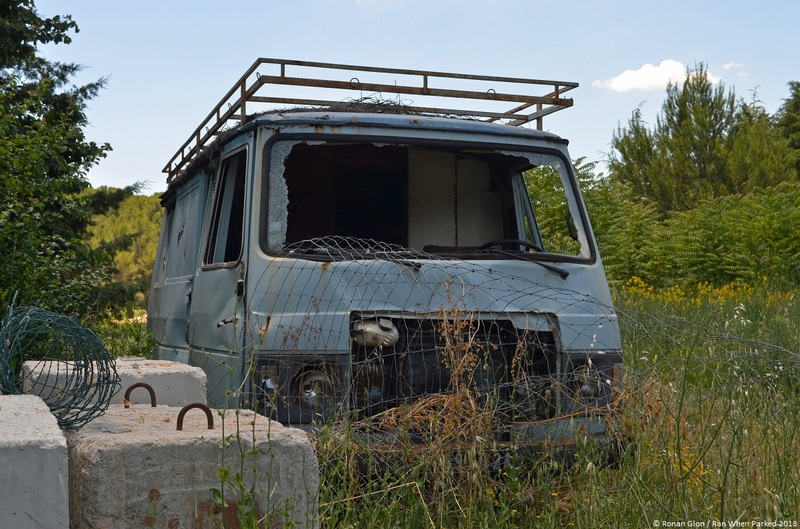 Last registered on the island of Corsica, the van appeared almost magically overnight and it hasn’t moved in several years. The J9’s condition has recently gone downhill because it has been vandalized on several occasions. The windshield and the rear windows have been smashed by rocks, the door handles have been broken, most of the emblems are gone and the rear wheels have been removed, leaving the van to balance unevenly on cinder blocks. The back of the vehicle has been shot at and it has several fairly deep gouges on the rear portion of the passenger side. J9 vans are unusual in light blue and diesel-powered models are still highly sought-after today, so it’s a shame to see this example rotting away, vandalized and otherwise abandoned.